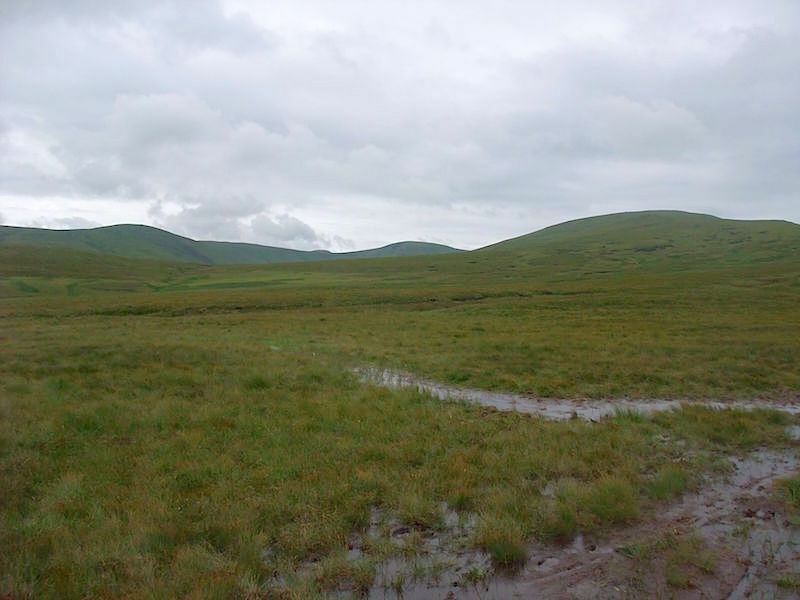 Its a grey, gloomy day as we look ahead to Great Dodd from a very soggy Matterdale Common. 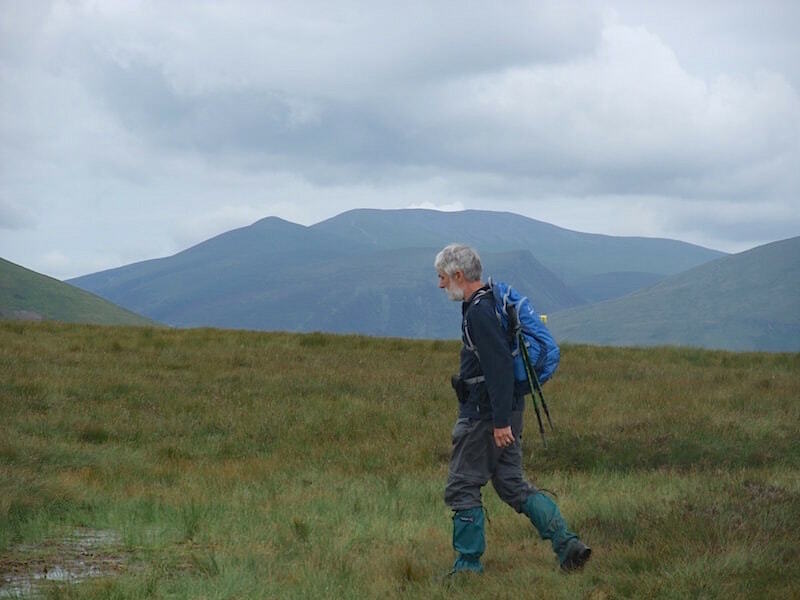 The Skiddaw group of fells over on the skyline as we trek across the common but, with leaden skies blocking the light, its difficult to pick out any any detail. The soggy, boggy path across the common. There were two men trying to cycle across here but they spent more time carrying the bikes than riding them. The bike wheels just sank into the mud and no amount of pedalling got them any further forward. They had to wait until they were on much higher ground where the going was a bit firmer before they could get back onto the saddles. 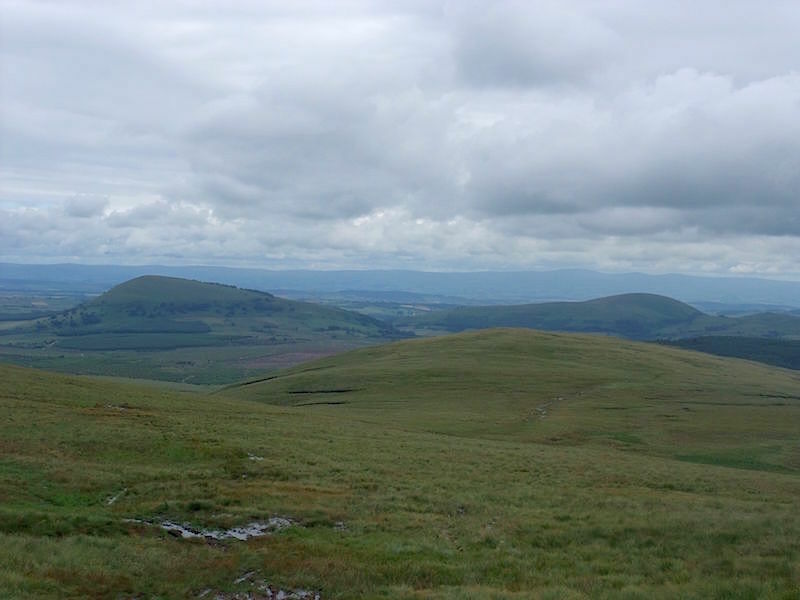 A look back down at our route so far, with Great Mell Fell and Little Mell Fell just beyond. 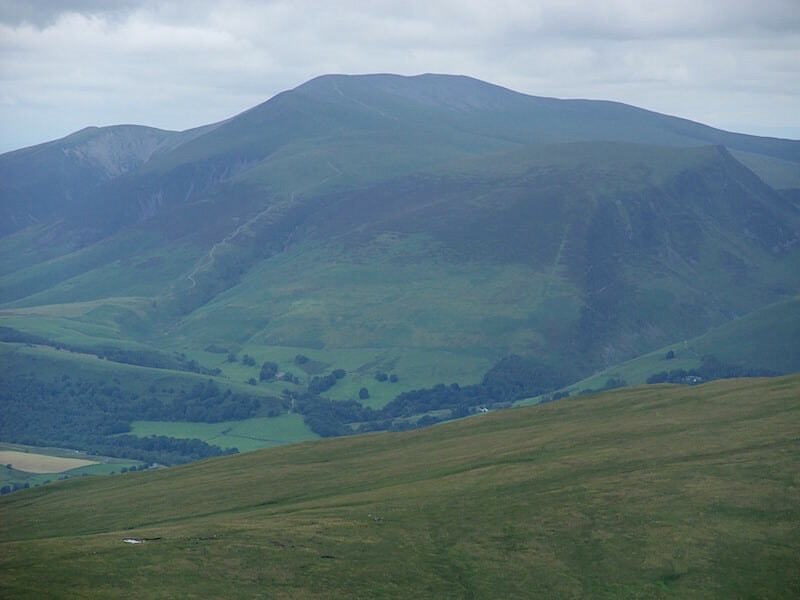 A close up of the Skiddaw group of fells, Lonscale Fell is the pointed one over on the right. Looking over Keswick to the Lord’s Seat fells and Bass Lake. 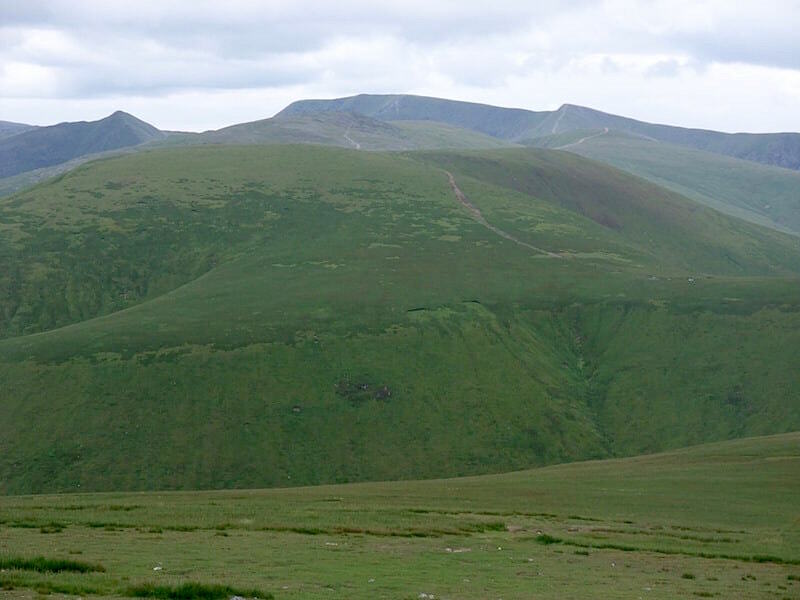 Some of the north western fells. 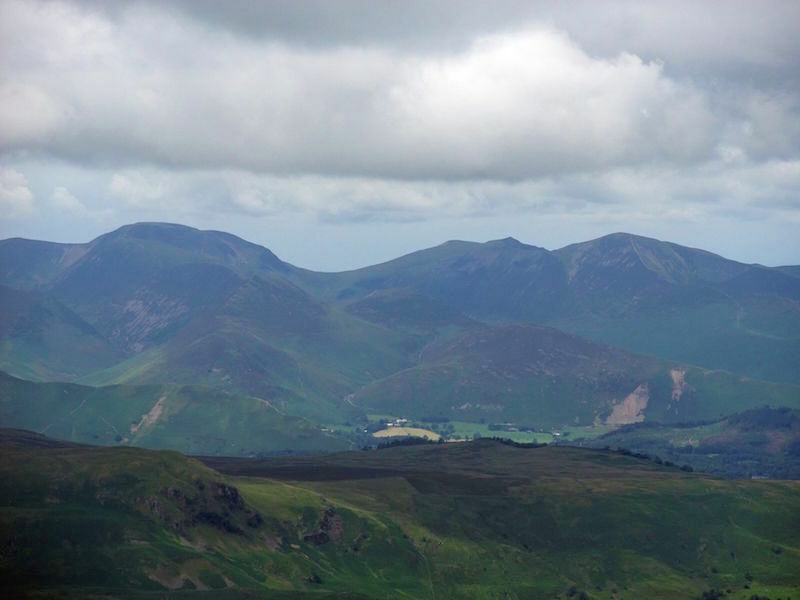 Its all very murky and difficult to distinguish but on the right skyline is Grisedale Pike, left of that is Hopegill Head, the U-shaped gap in the middle is Coledale Hause which rises up to Crag Hill. 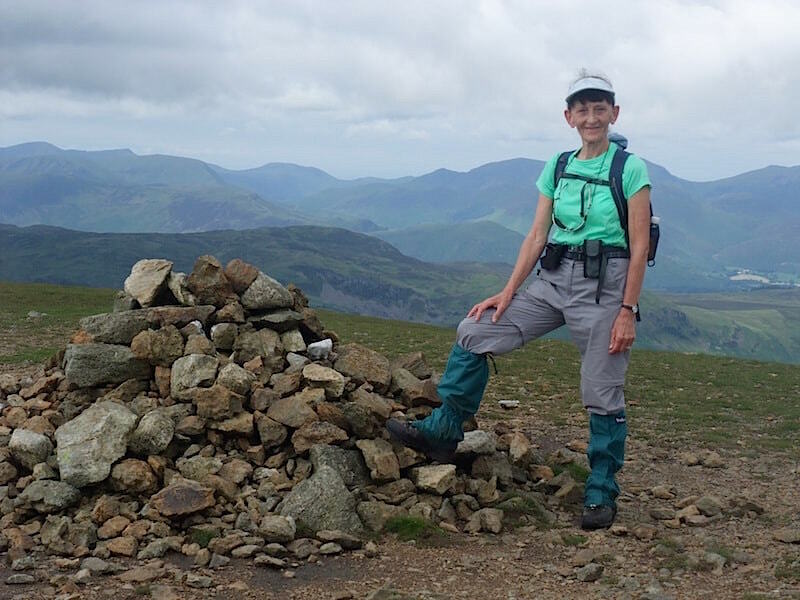 From Crag Hill you can walk down to Sail, from there to Scar Crags and on to Causey Pike. 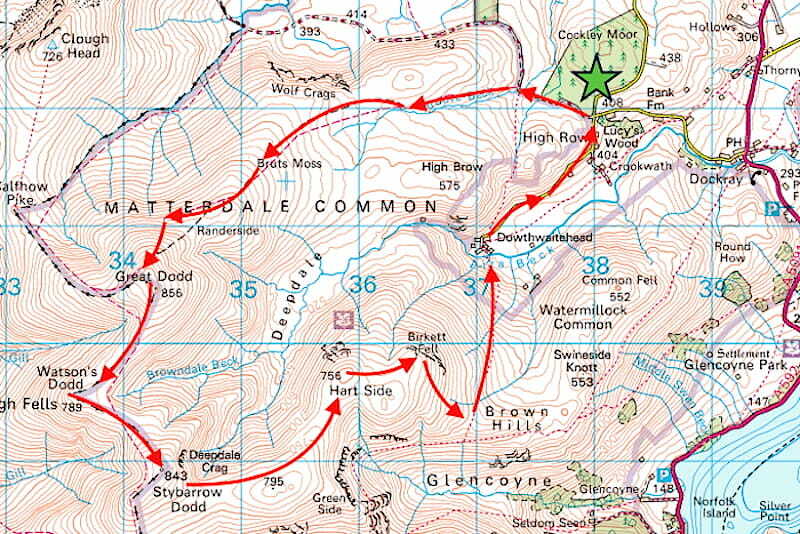 The whole walk is known as the Coledale Round. 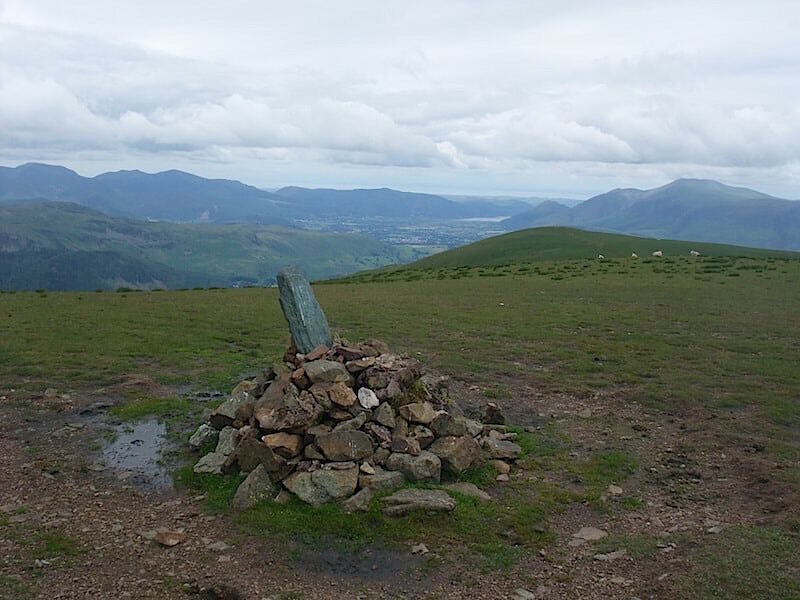 The view to the west from Great Dodd summit. It might be a dull day but at least the weather is better than it was on our walk up here last year …..
….. where we had to shout to make ourselves heard above the screaming wind …..
….. and where the cloud was so low and thick that we took refuge in the shelter, the low mound on the skyline between the cairn and the outcrop of rock on the left. Having recovered a little from the battering we were getting we decided against going across to Watson’s Dodd and called it a day. 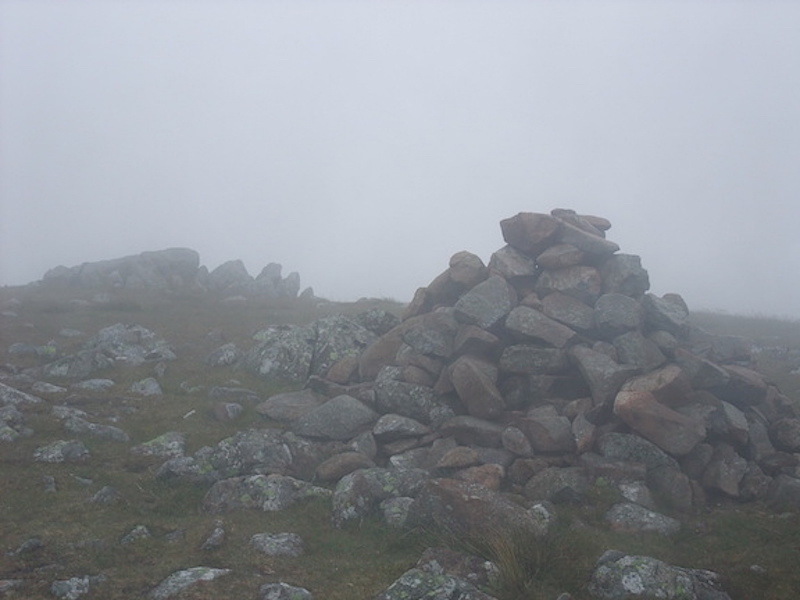 However during our time in the shelter the cloud had thickened and lowered and now we couldn’t even see the cairn any more, very disorientating. Map and compass came out and we were able to determine the direction we wanted to go and we battled our way back down to Randerside. Thankfully, down at the lower altitudes the wind strength was much less severe and by the time we were back on the Old Coach Road it had weakened considerably. We won’t forget that day. Still, that was then and this is now so on with the walk. 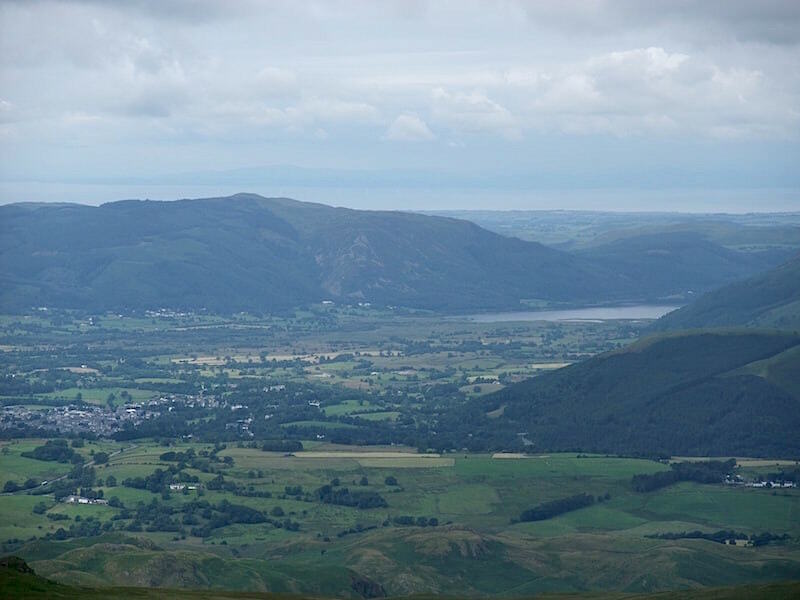 From Great Dodd its a very easy 3/4 mile grassy stroll over there to Watson’s Dodd. 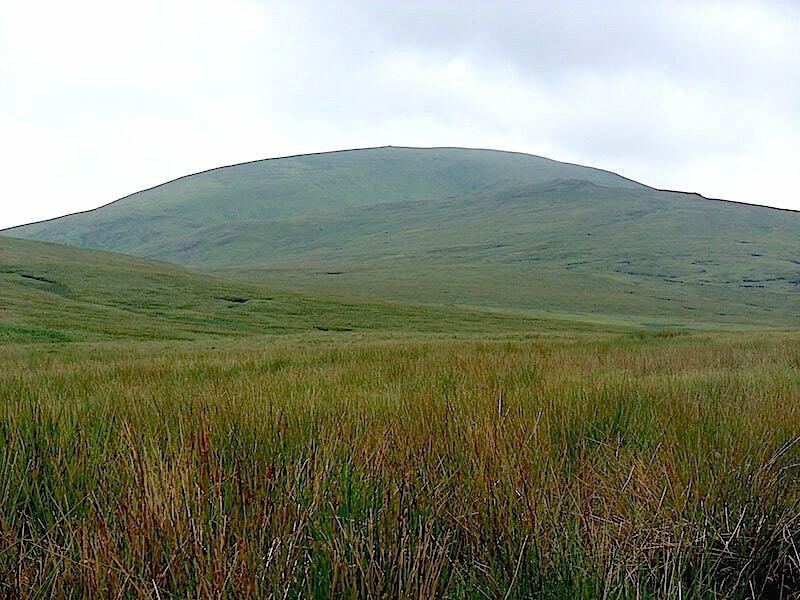 The fell opposite, with the path going across it, is Stybarrow Dodd and above that is Raise. It looks as if it is just a short walk between the two but they are about a mile apart with a dip in between. 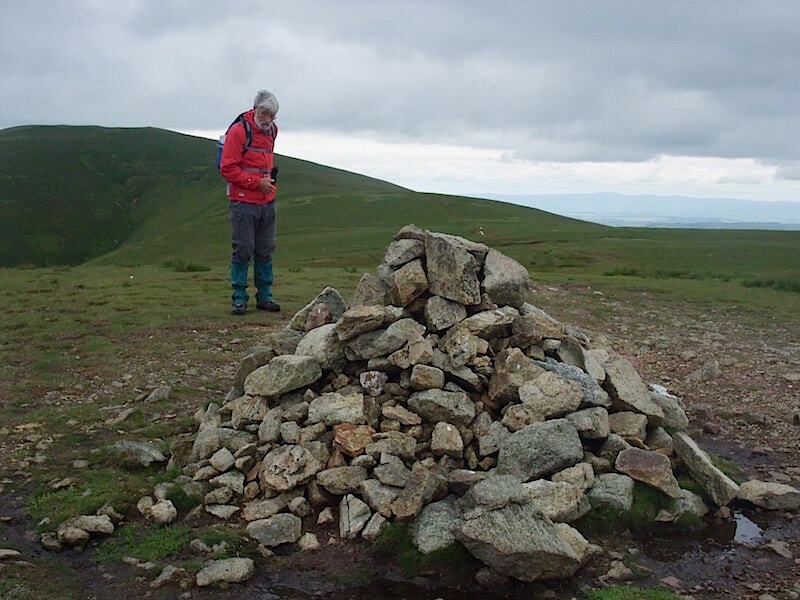 From Stybarrow you have to lose about 350′ in height to reach Sticks Pass, and then climb up another 450′ to reach the summit of Raise. 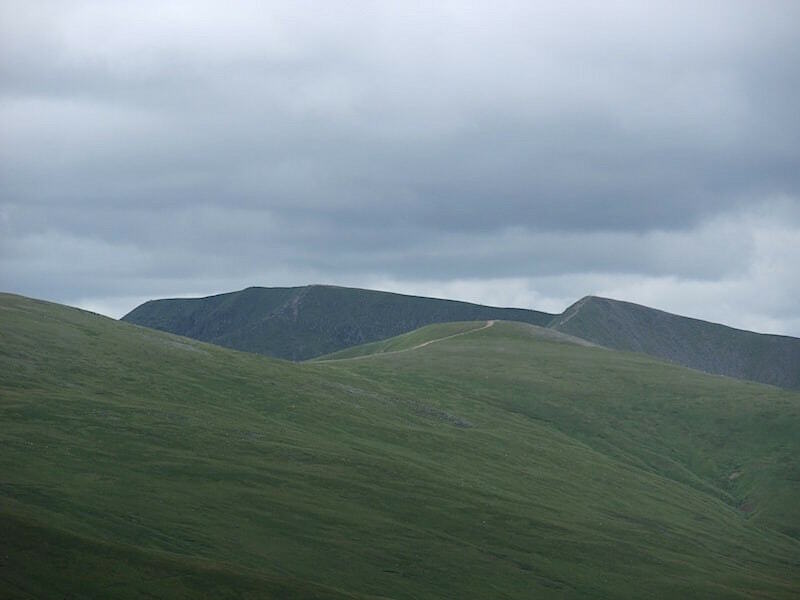 Behind Raise is Helvellyn, to the left of which is the peak of Catstycam, while over on the right is the peak of Helvellyn Lower Man. Just below Lower Man is White Side. 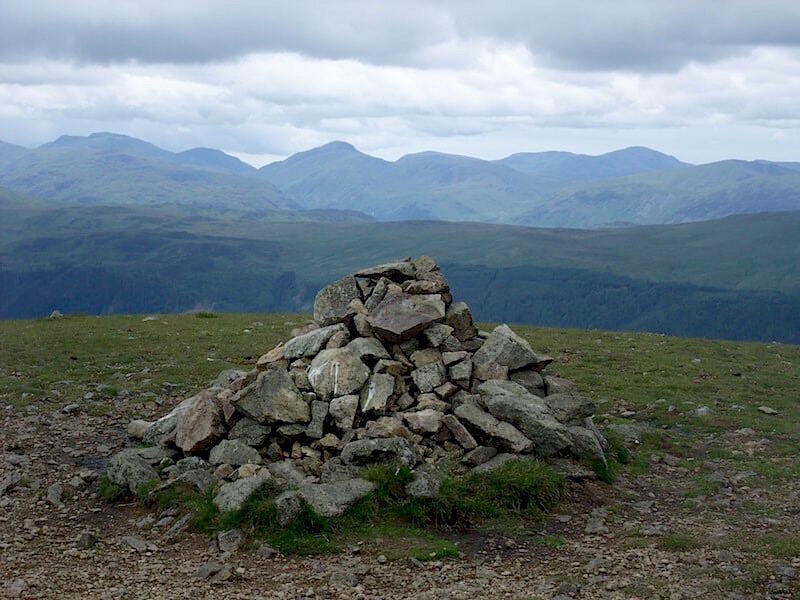 The view west from Watson’s Dodd summit cairn. 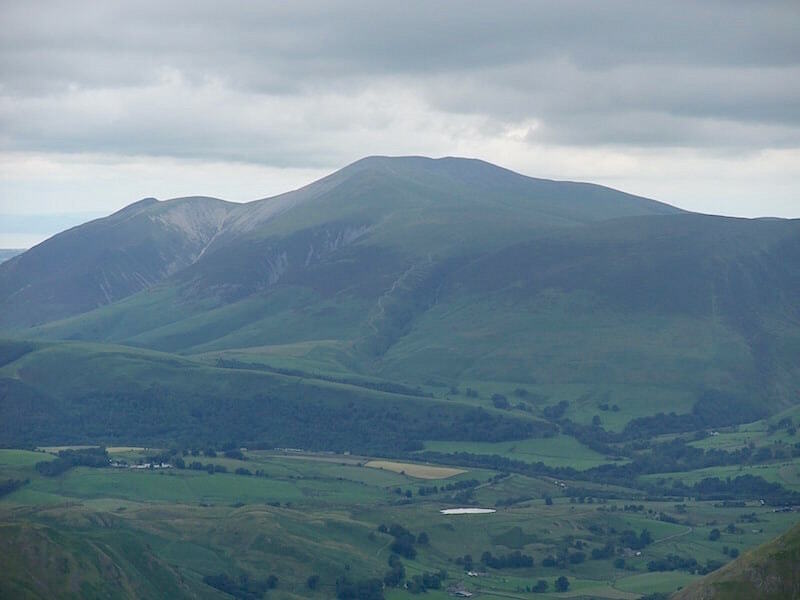 A closer look at the Skiddaw group, which makes Tewet Tarn below them look like nothing more than a large puddle. Looking across to Helvellyn and Helvellyn Lower Man, with the path from Raise going across to White Side. 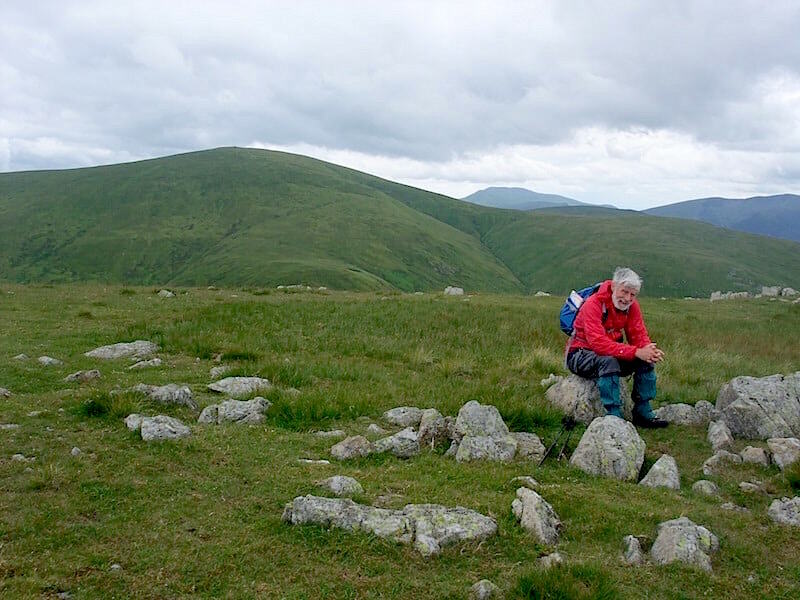 A look back to Great Dodd from Watson’s Dodd. The view westwards across Thirlmere. 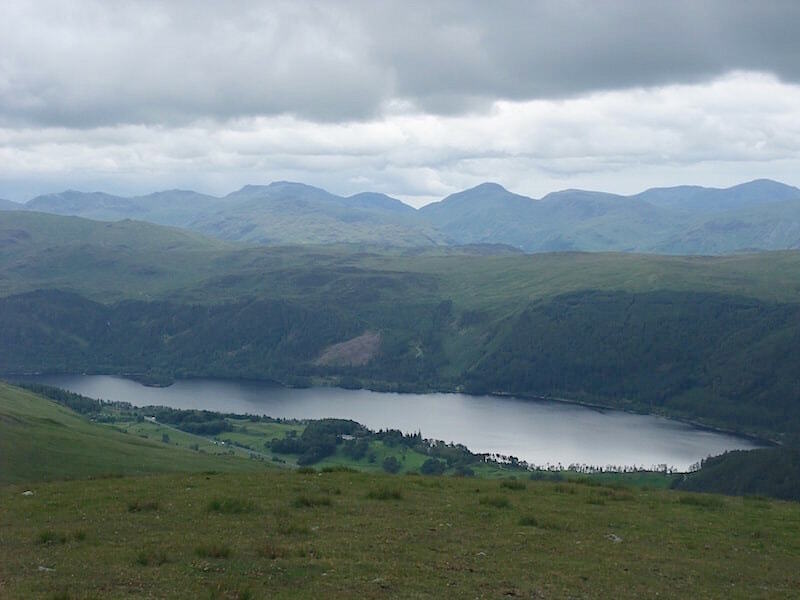 The Skiddaw fells, to the right, and a glimpse of Bass Lake behind Watson’s Dodd from Stybarrow Dodd. The path from Stybarrow Dodd leads us over to Hart Side with Great Dodd right behind us. Skiddaw and Blencathra are in the distance over to the right. 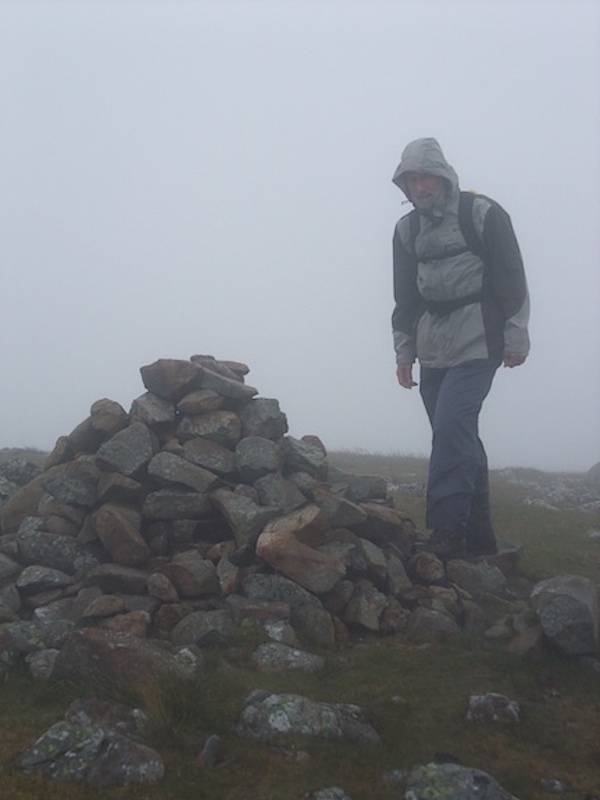 The cairn on Birkett Fell. 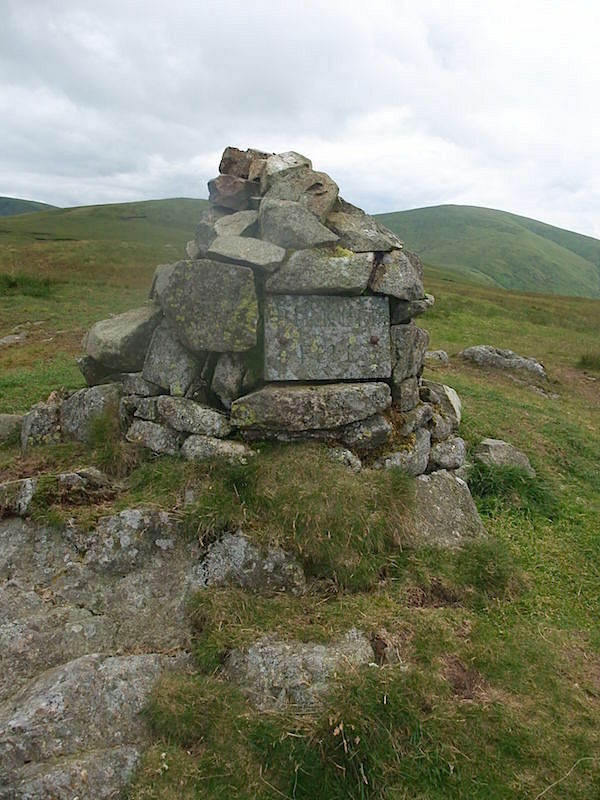 The fell was named after Lord Birkett who made a ‘deeply felt and eloquent speech’ in the House of Lords in 1962 criticising an element in the Manchester Corporation Bill. 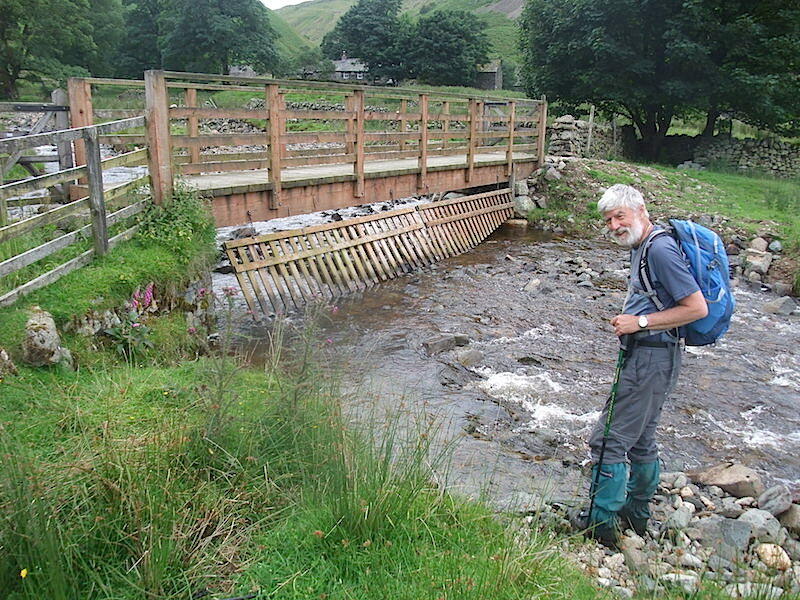 This would have allowed water to have been drained from Ullswater to meet the water requirements of Manchester. 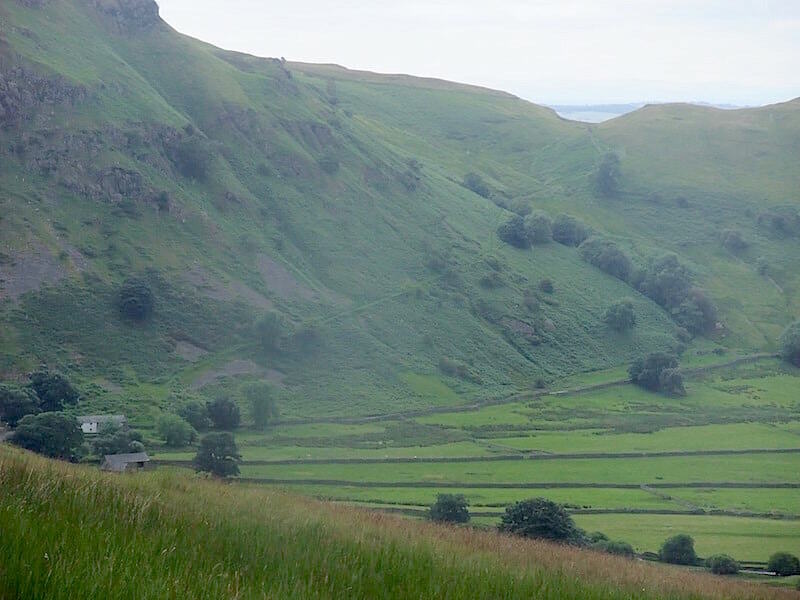 Lord Birkett and his supporters won the vote against allowing this to happen by 70 votes to 36 and so Ullswater remains intact and unspoiled for everyone to enjoy. In addition to having the fell, which overlooks Ullswater, named after him, the Ullswater Yacht Club now holds an annual Lord Birkett Memorial Trophy Race on the lake. I’m not trying to push it over, I’m stretching out my right leg. 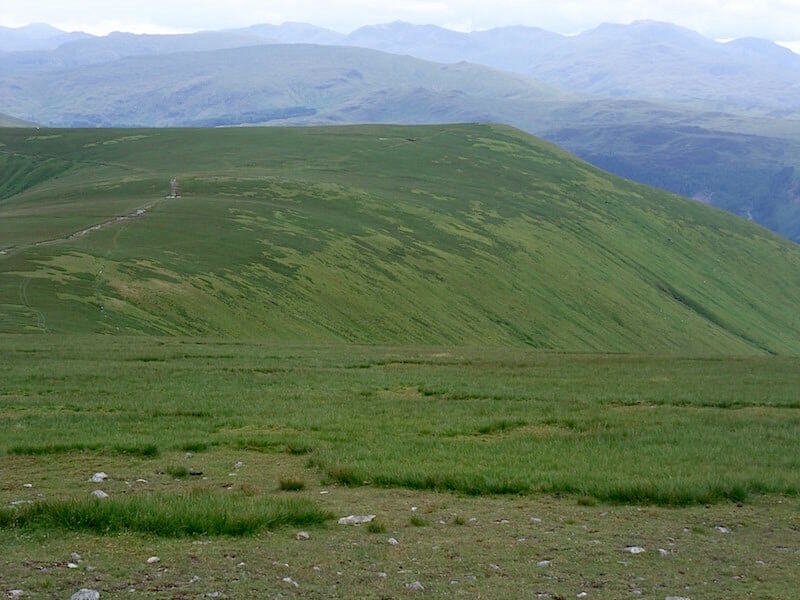 The walk from Hart Side to here cuts across the side of the fell so the right leg is always just that little bit higher than the left one and after a while you begin to feel the effect of it. We call this state of affairs ‘Birkett leg’, a name that has stuck and always applied on traverses of other fell slopes too. 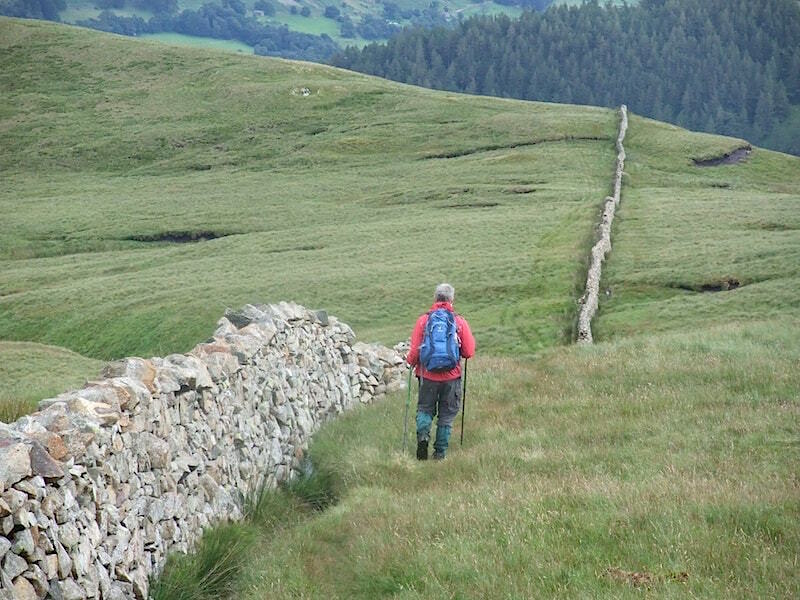 The descent from Birkett Fell couldn’t be simpler, just follow the wall. Below us are the farm buildings at Dowthwaite Head. On the left is the road, cutting across the lower slopes, which will take us back to the car parking area at High Row. 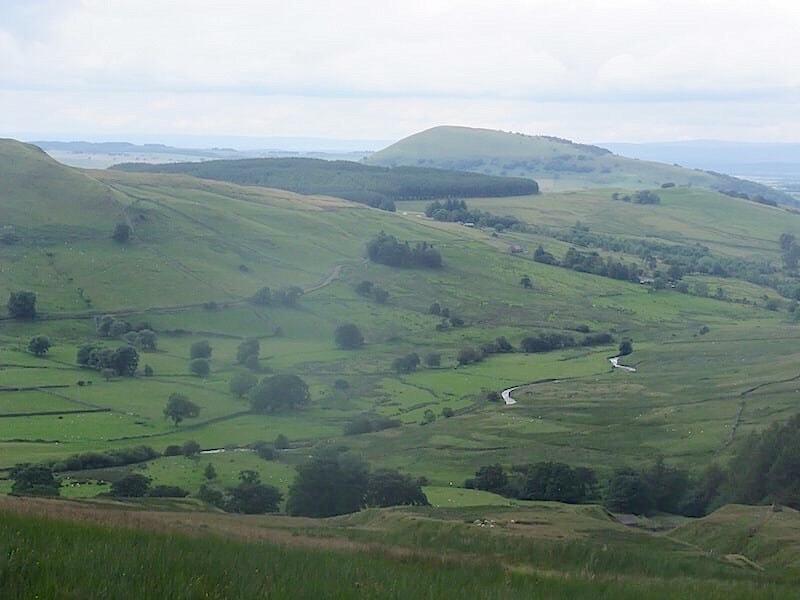 Great Mell Fell on the centre skyline. 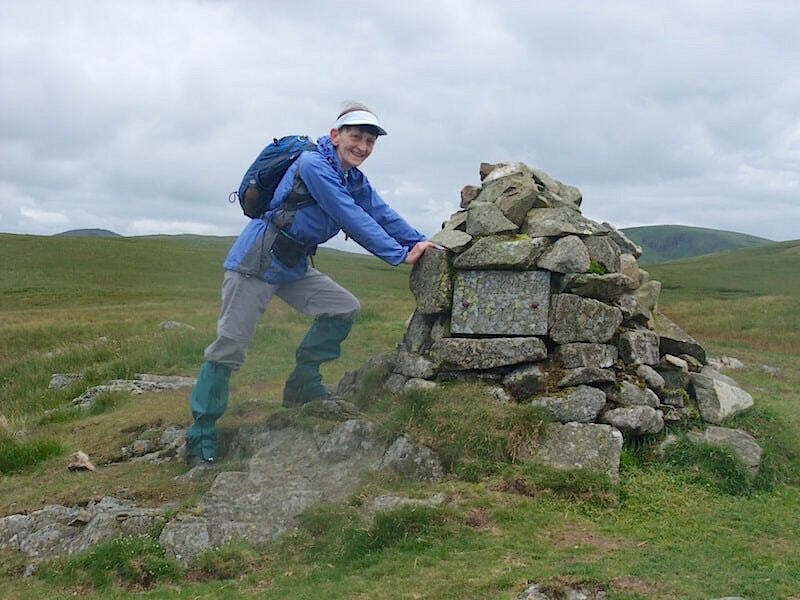 Back down at Dowthwaite Head and all that’s left to do is walk one mile along the road back to the car. It wasn’t much of a day as far as the weather was concerned so the photos suffered but, although it looked a bit threatening from time to time, it never got round to actually raining and that’s always a bonus when you’re out on the fells.